Ofgem’s minded-to position on the Targeted Charging Review is raising more than an eyebrow in GB renewables and flexibility communities. We were long expecting something along these lines from Ofgem, but the minded-to position on the Targeted Charging Review put out late November 2018 still managed to give us a bit of a jolt. If you’re not familiar with the Targeted Charging Review, Ofgem is undertaking a review of the ‘residual’ network charging mechanism and some of the few remaining embedded benefits. Why is Ofgem doing this? In recent years, the GB has seen an increasing number of prosumers with onsite generation and/or energy storage, and large consumers leveraging flexibility to managing their electricity consumption during periods of peak network charges. This has resulted in, in Ofgem’s words, “an unfair burden of charges” falling on those unable to manage their exposure to these charges through investing in flexibility or onsite generation. To be fair to Ofgem, the principal objectives of the Targeted Charging Review are not something one can fundamentally disagree with, but the potential impact of Ofgem’s ‘minded-to’ position on the GB renewables and flexibility sector cannot be ignored. If you haven’t had a chance to read the 96-page consultation document yet, here is Everoze’s brief assessment on what Ofgem’s ‘minded-to’ position means for battery storage, renewables and electric vehicles/V2B. Also, the proposal considers fixed residual charging to be the same for all sites in a particular segment irrespective of the size of the connection – it can be argued that the charges will be disproportionately levied on smaller users compared to larger users. The extent of variance and resulting level of impact depends on how the sites are segmented and the charges apportioned between the segments. This is a point that is being consulted by Ofgem. When are the reforms anticipated to be implemented? BSUoS embedded benefits – from either April 2020 or April 2021. But wait, all’s not set in stone yet! The consultation on the proposed reforms is currently open and the final outcome is subject to change from the current minded-to position. There are certainly many things to be excited about in the GB renewables and flexibility community. Utility-scale subsidy-free renewables are on the cusp of commercial viability in GB, and if the wholesale price trend that we saw last year in GB continue in the future, that’s certain to make subsidy-free renewables projects very compelling. And not to forget the energy storage sector where there is a lot of innovation on new commercial models and EVs benefiting from strong government push. We’re helping our clients understand the impact of these reforms on their storage and renewables assets through techno-economic feasibility modelling and as part of our technical due diligence and project advisory work. If you’ve got a behind-the-meter storage or an onsite renewables asset or are planning on installing one, and are keen to explore the technical and commercial impact on your project, feel free to give us a shout! 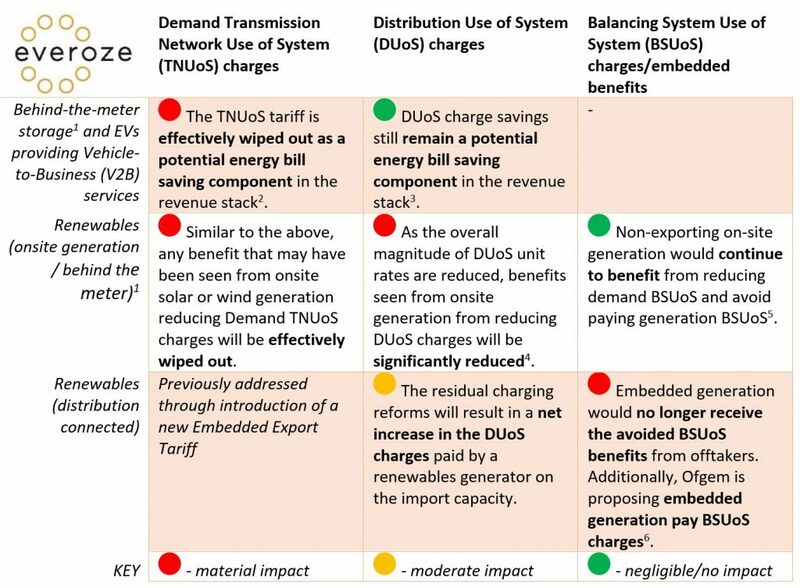 The TNUoS tariff is largely made up of the ‘residual’ component which is now no longer avoidable. In some high TNUoS regions like South West England, there will be a small locational component that may be avoidable. The residual component in DUoS charges is charged as a flat p/kWh charge in the DUoS unit rates (since April 2018) and with this residual charge component now removed, the tariff differential (which is what BtM storage targets in the revenue stack) between the peak red and amber/green unit rates are not affected. This is to be considered further when the BSUoS task force conclusions are available in Spring 2019. National Grid BSUoS forecast for 2019 is ~£2.5 /MWh. If the full BSUoS charging reforms are implemented, the net impact on embedded generation will be doubled.